Do you have a student who is struggling? Behavior management can be tough. Try this editable behavior chart to help manage behaviors. Simply choose 2 target goals for your student to focus on (these should be the 2 things that would have the greatest impact on their overall success). Then simply identify what those goals look like underneath the goal area (for the student to refer back to). 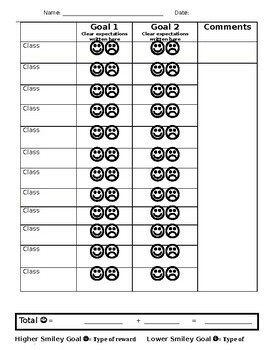 On the left hand side you can insert the student's schedule and then on the bottom of the page you can identify the smiley face goals and what rewards the student has an opportunity to earn.